Whatever your situation, it’s important to have a family attorney on your side who you can trust. With so many family law attorneys in Orange County, how do you know where to start? Whether you’re going through domestic violence, child custody, or divorce, you should thoroughly evaluate your situation and find a family attorney or Orange County divorce attorney to best suit your particular needs. 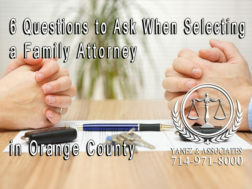 Consider these 6 questions when searching for family attorneys in Orange County. 1. Do you need a divorce or legal separation with the help of a family attorney? In many situations, couples may not be quite ready to end their marriage. There are many reasons for this. Some couples simply are not eligible for divorce in the state of California. Others may have religious or personal reasons. In a legal separation, partners cannot remarry but they may still retain a legal financial relationship involving healthcare, bank accounts, and tax filing. Both parties must agree to the legal separation. A divorce, on the other hand, fully terminates your marriage along with any legal relationship. This means each partner is free to remarry and may not share healthcare or file a joint tax return. Unlike a legal separation, a divorce only requires the request of one partner. 2. What are your child custody needs? Selecting a family attorney in Orange County for your child custody needs is an emotional time for everyone. Family court can be a daunting and cold process. Make sure to keep a few things in mind when evaluating how to best meet the needs of your child and family. There’s two different types of custody: legal custody and physical custody. The parent granted legal custody is in charge of making legal decisions for the child such as healthcare, school, and welfare. Physical custody refers to where the child resides. It’s the judge’s job to decide which arrangement would best suit the needs of your child. The judge will take many factors into consideration such as financial stability as well as the age of the children and their requests. If you and your partner reach a child custody agreement outside of the court, the judge is likely to grant your request. 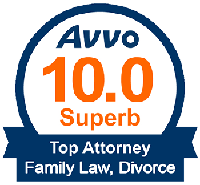 Make sure you select a family law attorney in Orange County to best fit your particular needs. 3. How will you handle property distribution? Property distribution is a touchy subject because it encompasses just about our entire life. As a couple, you accumulate property jointly so this can make the divorce or separation process particularly tricky. When people think of property distribution, they typically think of the big-ticket assets such as your home, vehicles, or jewelry. Don’t forget property includes several financial accounts such as stocks, 401ks, life insurance, and much more. Property also includes many items we might not consider such as deposits on rental properties, businesses, as well as intellectual property. When searching for family law attorneys in Orange County, be sure to thoroughly consider your property distribution goals. 4. Are you seeking or facing child support or spousal support? The state of California has a precise formula for deciding how much child support a partner may owe. This amount is based on several financial factors including income, savings, healthcare, union dues, etc. Your judge also takes other aspects into consideration such as how much time a parent spends with the child. When deciding spousal support, your judge looks at many factors. The court will evaluate the length of the relationship, all debts and property, as well as each partner’s physical and financial wellbeing. They also consider any financial sacrifices one partner may have made to the benefit of the other partner. This could include turning down career advancement to care for the family. It could also include whether or not one partner helped the other complete education or job training programs. Whether you’re facing or seeking financial support, you’ll want to select a family law attorney in Orange County you can trust. 5. Is domestic abuse or violence involved? If your family law situation involves domestic violence or abuse against yourself or your children, this could drastically impact the outcome of your case. Instead of a divorce or legal separation, you could be eligible for an annulment if you’ve experienced domestic violence or were coerced into the relationship. An annulment is much faster and simpler than other routes. Whether domestic violence was physical or emotional, this could also affect property distribution, child custody, and support payments. On the other hand, you should know your rights if you find yourself falsely accused of domestic violence or abuse. It is important to contact a family attorney in Orange County to thoroughly consider your case and help you understand your rights. 6. What’s the plan if things don’t work out? You want things to be as seamless as possible, but family law cases involve many factors. What will you do if your partner stops paying support or their financial situation changes? What will you do if your partner accuses you of abuse? What if you and your partner both agree on something in court and then one party doesn’t live up to their side of the agreement? If your spouse stops or refuses support payments you have many legal options. Your lawyer might try to garnish wages, freeze bank accounts, suspend licenses or passports, or intercept funds in a number of other ways. You need a dedicated lawyer on your side who will take the time to understand your situation and needs. This could make-or-break the outcome of your case. At Yanez & Associates, we offer free consultations so there’s no risk. If you’re ready to discuss your options, contact us today to schedule an appointment.